V&F proudly presents the brand new CombiSense model 2013. 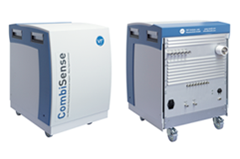 The CombiSense is a combination of an Electron Impact (EI-MS) and an Ion-Molecule Reaction (IMR-MS) mass spectrometer in one analyzer unit for a broad range of applications. Due to the new construction of the CombiSense there are completely separated vacuum systems of the IMR and the EI mass spectormeter. Both systems are equipped with their own turbo molecular pumps.